Amanda Peet isn’t just an award-winning actress. She’s also a wife and a mother to two young children. As an informed parent, Amanda Peet takes an active role in keeping her family healthy. And as an Every Child By Two vaccine ambassador, she knows that immunizations are the best way to protect herself and her family from preventable diseases such as influenza. This is why Amanda got her seasonal flu vaccination at a local Walgreens yesterday. By participating in the “Get a Shot. Give A Shot.” campaign, Amanda will not only help keep her from getting the flu, but her actions will prompt Walgreens to provide a life-saving vaccination to a child in a developing country. As Amanda Peet received her vaccination in New York City, she was echoing the sentiment of influenza experts speaking simultaneously in Washington, DC. The National Foundation of Infectious Diseases hosted a press conference yesterday to share information about last season’s vaccination rates and provide details about the various vaccines and tools available to the public this year. The early onset of the last year’s flu, followed by 15 weeks of an intense and elevated season, resulted in record hospitalizations among the elderly. Even though more people were vaccinated last year than ever before, (with 42% of adults and 57% of children), there were 164 children that lost their lives to influenza, the highest number of pediatric deaths every recorded with the exception of the H1N1 pandemic year. As research continues to support vaccination as a critical way to protect expectant mothers, as well as their babies, from flu, a CDC surveys suggests that a record number (51%) of pregnant women were vaccinated. Interestingly enough, the survey also indicated that their decisions were largely impacted by the actions of their providers. If pregnant women received a provider recommendation and offer of vaccination, they were substantially more likely to receive a vaccination (70.5%) than those only receiving a recommendation (46.3%) or those who received neither a recommendation nor offer (16.1%). Another interesting analysis on last year’s vaccination uptake relates to healthcare workers. The CDC determined that 92% of physicians, 89% of pharmacists, nurse practitioners and physician assistants were vaccinated last year. While these numbers may seem high, the overall message was that we can, and should, do better. Further analysis clarified that cost and accessibility of flu vaccination can play a role in vaccination uptake, especially among healthcare workers. Hospitals appear to be doing a good job at offering on site clinics that contributed to the 83% of vaccinated hospital workers last year. In contrast, only 59% of people working in long-term care facilities were adequately vaccinated, putting their elderly patrons at an increased risk of influenza related hospitalizations and death. 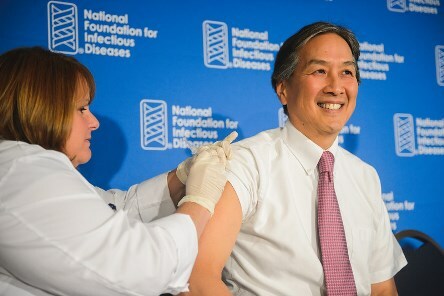 Dr. Koh gets himself vaccinated at the NFID Press Conference. Photo courtesy of NFID. He explained, that we must continue to emphasize prevention and public health and encourage all healthcare providers to ensure that all adults and children over the age of six months get vaccinated as recommended. In preparation for the current season, Dr. Anne Schuchat, Director of the National Center for Immunization and Respiratory Diseases at the CDC, explained this year’s vaccination options. They include a new quadrivalent vaccine (with two A strains and two B strains) that will make up some of the shots and all of the nasal mist vaccines that are available. There will also be various trivalent vaccines (with two A strains and one B strain) to include one that is made egg free (recombinant) for those with egg allergies, a high dose vaccine formulated to boost the elderly immune system of people 65 of age and older, as well as a tiny needle (intradermal) vaccine that is delivered just under the skin of the upper arm. Additionally, there are also two tools that the public may find helpful this season. The first is a vaccine finder that maps nearby vaccination locations in order to improve vaccine accessibility. The second is a live tracking tool that monitors Medicare flu vaccines that are administered and maps them by locality and state to provide a snapshot of vaccination uptake. Flu experts at the press conference were hopeful that this information would encourage people to get vaccinated before they come into contact with the flu virus. The public was reminded that it takes 10 days to 2 weeks to build up immunity after influenza vaccination, so people should be getting vaccinated now. “The verdict is out on flu shots. Many medical experts now agree it is more important to protect yourself and your family from the flu vaccine than the flu itself. Every year the pharmaceutical industry, medical experts and the mainstream media work hard to convince us to get vaccinated against the flu. But we’re not being told the whole story. present here аnd can’t wait tо take a loοk when I gеt home.